THE HELICOPTER BECOMES A TOOL WHICH NEEDS TO BE FLOWN INSTINCTIVELY BY FEEL AND SOUND, EVERYTHING BECOMES ABOUT THE ANIMAL, NOT THE FLYING. Mass capture is a method whereby a large number of animals are captured in a short period of time by herding them into a large funnel shaped enclosure called a boma. 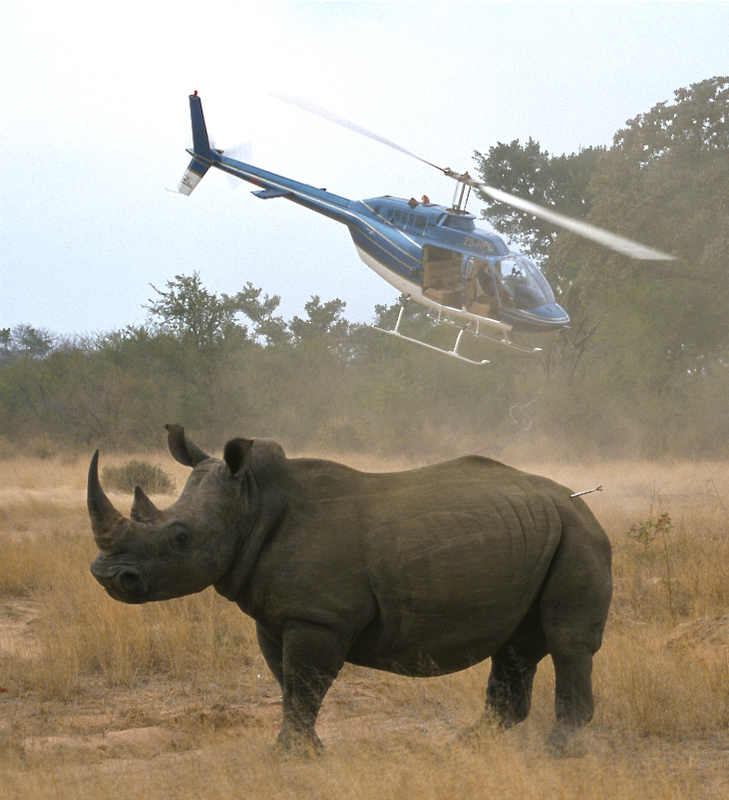 Positioning the boma is done from the air, at a site that has suitable natural vegetation, frequently used game paths, minimal obstacles and a good road system in close proximity for transporting the captured game. A plastic “V-shaped” boma is then erected, the vegetation effectively hiding the boma from sight. Curtains hanging from an upper cable are bunched and well hidden at the mouth of the V, which are pulled closed by people on signal from the pilot at the moment the animals pass through the boma mouth. 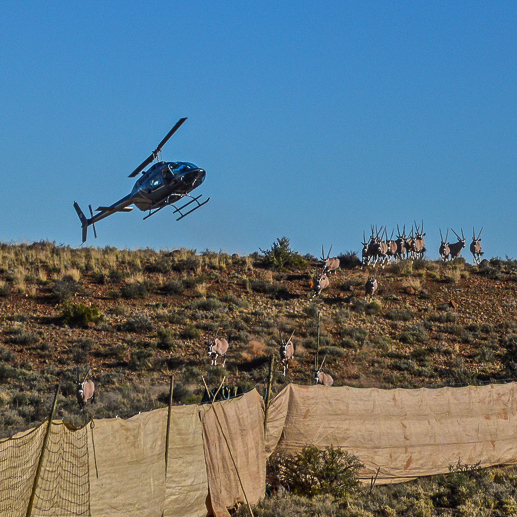 Green nylon sheeting is used for bushveld capture, while beige nylon and/or net bomas are erected in grassland areas. 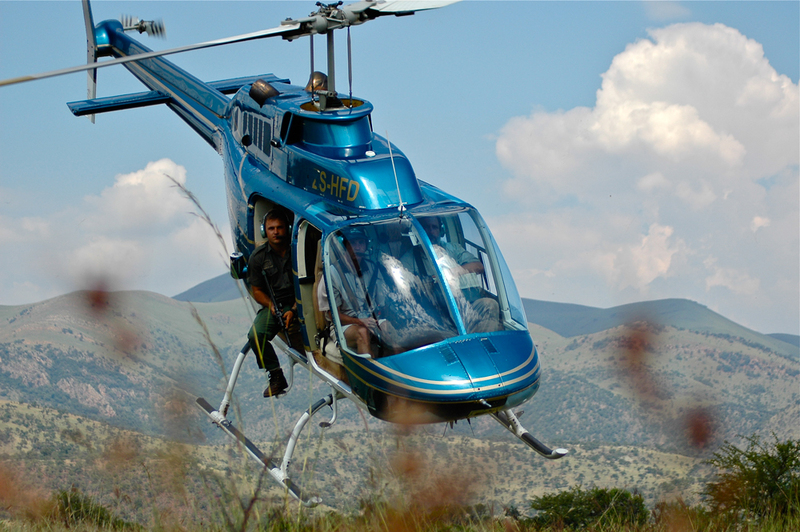 The pilot selects the species and numbers required and uses the helicopter much like a sheepdog to guide the game into the boma. Each game species has its own unique behavior and the pilot must read each situation precisely in order to succeed in their capture. All flying is conducted down wind and low level, exposing the pilot and aircraft to demanding conditions. The helicopters most frequently used for mass capture are the R22, R44 and Hughes 300. “The helicopter has to be flown instinctively by feel and sound, and this can only happen when the pilot gets to the point where he straps the helicopter to his back and the machine responds to his thought and sight. There can be no more flying with most of your attention on the manifold pressure, you have to instinctively know that you are on 22 inches and already be making a contingency plan to get out of trouble as you feel your way over 21 inches. This must happen without thought because your thought process is too busy taking in the line of flight of the weaving, galloping Sable bull that is doing an awesome job of throwing you off….and you have to get a dart into him before he runs too much and dies of capture myopathy. This can only happen if you anticipate his next move at 65 mph while you dive between the branches of the passing tree, holding the aircraft steady so the vet can aim, and a split second later pull up to avoid colliding with the next tree while not losing visual contact with the darted animal since he turned 180 degrees on a dime and escaped away in the opposite direction for cover. Obviously all this happened while you were flying down wind and the Sable was galloping at speed toward the boundary fence where there were power lines right across your path. During this madness you are coordinating the ground crew vehicle to not get in your way but to be as close as possible to save time in recovering the animal and you dare not take your eyes off him as you are noting a female Sable’s position as she flushes out of a clump of bushes to the left. The owner of the farm is there and he is known to be a difficult person. He is watching the flying time and if you lose an animal you can bet he will sue you for the R190 000,00 value of the animal. More than that though, this Sable bull happens to be one of only a few of its kind left, he is a trophy and his genes are vital for a crucial breeding project. There are huge rock outcrops on the farm and it’s the pilots job to make sure the darted animal does not end up high in the rocks, or he will not be recoverable to load onto the vehicle and will have to be woken up. Also there are not enough people in the ground crew to carry such an animal, so when the Sable goes down you have to land right next to him to help hold and load him. All of this needs to be done without denting the helicopter or the people inside it. The whole affair becomes less about being a helicopter pilot and more about being a focused person with the right attitude. The focus is on the animal’s well being first, and then your interaction with the client, ground team, vet and your ability to pull the entire operation off effortlessly.